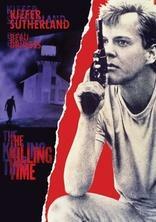 A young psychopath (Kiefer Sutherland) murders a man who was en route to an idyllic California community, where the victim was slated to become the new deputy sheriff. The killer assumes the identity of the dead man and shows up in the beach town, where he's accepted as a new lawman. Meanwhile, the town's sheriff, Sam (Beau Bridges), plans to knock off the husband of his secret lover. Sam thinks his new deputy will make the perfect fall guy, but he doesn't know he's dealing with a dangerous man.